We are proud to welcome FIDE Master Danilo Cerovic (2364) of Wisdom Chess Academy to the Bellaire Chess Club. 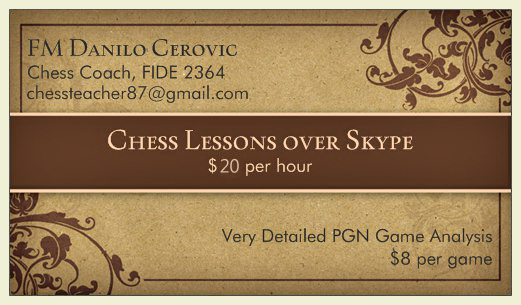 Danilo is a full time chess instructor who has trained both kids and adults for over 10 years. His coaching price is very affordable at only $20 per hour. The lessons are one-on-one and Danilo teaches over Skype via screen sharing. For more information contact chessteacher87@gmail.com.